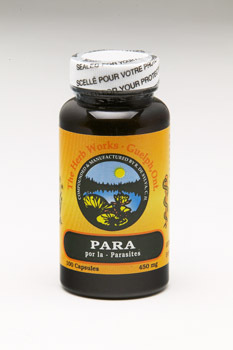 According to many reputable health care experts, both in the field of natural healthcare and modern medicine, parasites are now a major problem. They are, or can be responsible for a plethora of conditions such as chronic fatigue, irritable bowel syndrome, Chrohn’s Disease, male/female reproductive tract problems, rheumatoid arthritis, fibromyalgia, anemia, erratic blood sugar levels ,poor appetite, rapid hair loss, mental or physical lethargy, bloating, poor sleep patterns, and many, many other conditions. In fact, some holistic doctors have even attributed some forms of mental illness and even psychosis, to the invasion of the mind and body by parasites. While approximately 30% reside in the intestinal tract, the remaining 70% can burrow into muscle (fibromyalgia) articulated joints (rheumatoid arthritis) the liver , spleen, pancreas (fluctuating sugar levels…), sinus cavities, soft tissue, reproductive tracts, in fact, anywhere in the body they can find a quiet little place to hang out and call home .One parasite in particular (necator americanus) can secrete a substance that tricks the immune system by masking its presence in the body. This is not to suggest that the situation is hopeless, or that we are powerless to do anything about it; on the contrary, Nature has given us many herbal agents that will help rid us of these unwanted ‘guests’. One of the first steps is to clean out the bowel (or tissues) of any accumulated matter that they can feed upon. This matter may be in the bowel – large or small, or it may be the gradual accumulation over time, of matter that has been deposited in the interstices of tissue, anywhere in the body. Ideally, the filtering aspects of the body – the liver and kidneys, should be able to handle this, but in reality,, they become clogged and underfunctioning over time. The end result is that the blood becomes very toxic and acidic…. a perfect breeding ground for parasites and other pathogens. Parasites can range in size from the microscopic protozoa , to the larger ‘helminth’ type worms such as the fish or pork tapeworm that can grow up to 20+ feet in length. Over the past 5-6 years, we have refined our formula to deal with most of the more common parasites and sizes of worms. 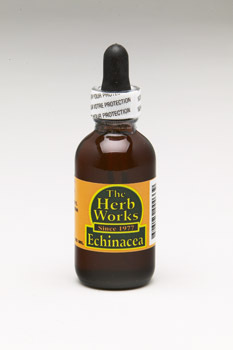 (for serious cases of tapeworms, we have an additional Tincture to take with this formula…) We have dealt successfully with the microscopic parasites, entamoeba hystolitica, e. parvifolium, e.hartmanii, etc. This formula will also work on the blastocystis hominis parasite that can cause explosive diarrhea, as well as lumbricoid and pinworms. We have literally searched the world for the best anthelmintic or worm killing herbs, and combined them with some of the best that grow here in Ontario. This formula, combined with a change in diet, an increase in friendly bacteria in the gut, and the concerted effort to pursue an appropriate regimen will result in the elimination of these freeloaders. As with the doctors in Germany, who place their patients on a parasite cleanse once a year regardless, we do strongly recommend the same program frequency here in north America as well. Prevention as a pre-emptive approach, will work wonders for you and your family. 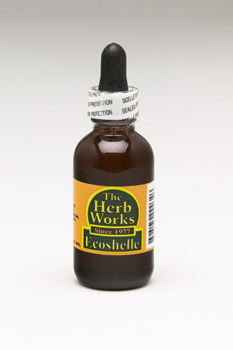 Recommendations: Take this formula along with the bottled CLOVES and the WALNUT HULL TINCTURE. The CLOVES will kill the eggs of the parasites, and the WALNUT HULL provides powerful support to the PARA formula. 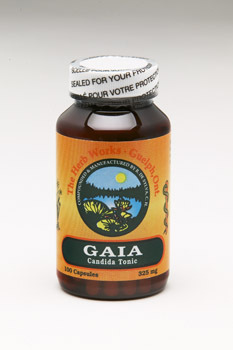 Suggested Dosage:	Take 3 capsules mid-morning and again late afternoon or early evening. Contra-Indications:	Do not take in cases of inflammatory processes in the bowel, or while pregnant or nursing. Many people today suffer from what is called ‘dysbiosis’ – a term used to describe the turmoil that results from a disturbance in the innate optimum levels of friendly bacteria in the gut. Various signs and symptoms include bloating in the abdomen, excess flatulence and belching ,candida albicans in all its forms and manifestations, Crohn’s disease, ulcerative colitis, a feeling of ‘spaciness’, disordered thought processes and short term memory loss, skin conditions such as psoriasis and eczema ,parasites, even some cases of depression can be attributed to the mycotoxins that ensue from this type of internal environment. This condition can be brought on by the prolonged use of antibiotics, stress, poor diet, excess intake of sugar and yeasted foods, and even poor oxygenation. It truly is one of the most prolific underlying components of diseases particular to our modern age. In addition to promoting candida and its variants ,it is an underlying component of cancer ,multiple sclerosis, AIDS, most chronic (degenerative) conditions such as fibromyalgia, chronic fatigue syndrome, parasites and even some allergies. The importance of maintaining a healthy colon – long a mainstay of natural health proponents and old style practitioners, has thus been corroborated by the studies today on the effects of friendly bacteria in the gut. Thus our rationale for including the various bacteria listed above…. lactobacillus acidophilus DDS(tm): this special strain of acidophilus developed and patented by Dr Kem Shahani, is much more resistant to higher temperatures ,produces a natural antibiotic called acidophilin, as well as anti-viral compounds. The b. bacterium, l. bulgaricus, and s. thermophilus all help to produce lactic acid and hydrogen peroxide; it is the latter substance that breaks down into water and a molecule of Oxygen. This is most important as the production of Oxygen helps to overcome the anaerobic bacteria, eg. those that thrive in an Oxygen deficient environment .Likewise, their production of lactic acid,along with acetic and benzoic acids, inhibit the production of pathogenic bacteria. 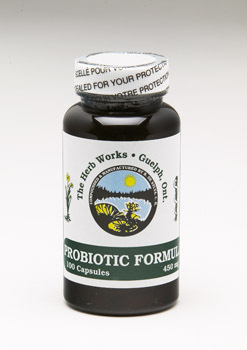 The addition of FOS, that is fructooligosaccharides from Jerusalem artichokes, provides a nourishing base for these friendly bacteria to grow and proliferate. It is very important to help repopulate the gut with the friendly bacteria; when the lining of the intestinal tract is colonized with pathogenic bacteria, the dysbiosis referred to above, will take hold and develop into a myriad of ailments. Suggested Dosage:	Take 3 capsules ½ hour BEFORE the morning meal, and again ½ hour BEFORE the evening meal. Notes:	This preparation should be used as an adjunct in the treatment of candida albicans, parasites and many of the conditions referred to in the beginning of this fact sheet. A number of years ago, Ed McCabe, one of North America’s foremost authorities on Oxygen therapies, stated that the amount of available Oxygen in the environment, had dropped from 19-21% at the turn of the century, to a current 13-15%, and, in the big cities, around 9-11%. Couple this with the findings of Dr. Otto Warburg, who won the Nobel Prize for Medicine in 1933, for proving (amongst other things) that cancer was caused by a lack of Oxygen at the cellular level, and one can begin to appreciate just exactly why cancer is so rampant in our world today. Yet in spite of this information, smoking continues, pollution increases, and human suffering grows in direct proportion to our continual ignorance of the basic need for Oxygen and healthy lungs to ‘capture’ it from the air that we breathe. Is it any wonder that so many people, especially in the big cities, suffer from asthma, bronchitis, lung disorders and a variety of related conditions ? Candida especially,- an example of an anaerobic or oxygen deficient condition, is aggravated by insufficient amounts of Oxygen, and our lungs inability to provide the cells of the body with generous amounts of this life-giving element . Of further concern, is that the lungs are a bit of a dumping ground for matter from the blood; not only do they exchange gases, but waste matter is deposited in the lungs from the bloodstream. The vital force of the body simply uses this venue to eliminate this ‘sludge’ from our system; however, a chronic cough soon develops, in an effort to expectorate this matter from the lungs and bronchi.It is very important to to help this process, by eliminating mucous forming foods from our diet: milk and cheese being the biggest culprits, followed by white flour products. 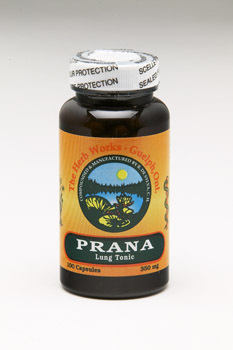 PRANA has been formulated to help dissolve this catarrh and stimulate its expectoration. It will also help reduce inflammation , nourish alveolar tissue, and restore the lungs capacity to throw off carbon dioxide, and take in copious amounts of life giving Oxygen. Ingredients:	Fenugreek Seeds, Elecampane Root, Wild Cherry Bark, Gum Plant, Horehound, Mullein Leaves, St. John’s Wort, Nettle, Althea Rt., Aniseseed. 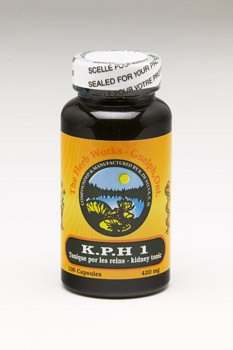 Suggested Dosage:	Take 2-3 capsules, mid-morning, mid-afternoon, and mid-evening. Contra-Indications:	Not to be used by pregnant or lactating women, or combined with pharmaceuticals for broncho-pulmonary disorders. One of the most common and re-occurring problems is that of disturbances in the reproductive tracts of women .In the past 10-12 years, more and more do we see examples of young girls entering the time of their menses quite early, but even then, with difficult cycles more commonly seen in women who were in their thirties before they had such problems.This latter group in turn, have noted that their monthly cycle has become progressively more difficult as the years go by. Finally, women in their forties increasingly undergo hysterectomies on the advice of their doctors, as a way to escape the protracted and difficult periods they endure. Even the onset of the menarche, brings with it disturbances in hormonal balances, and it s attendant problems of mood swings, hot flashes, disturbed sleep ,etc. Aside from hormonal components to the above problems(which are best dealt with by our OMEGA)there is a need to address the bloating ,pelvic fullness, severe cramping ,heavy and prolonged flows, and other debilitating symptoms that occur all too frequently. Attention must be paid to diet – which is a major contributor in that junk foods ,fried foods ,excessive meat consumption/sparse vegetables and fruits contribute to overly acidic, congested blood. Lifestyle and stress likewise add to the mix, with the end result that the reproductive tract , by default, can act as a channel to help eliminate toxic waste matter.This is the primary cause of the irritation to the nerves, tissue congestion, pain, etc that are experienced. It is for the above reasons, that we have designed this particular blend. 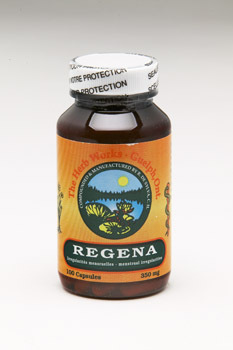 These herbs and roots will help to strengthen and tone the reproductive system…. eliminating the deposition of matter in the cells ,nourishing and astringing the tissues, calming the nerves, and provide a soothing and toning influence to tissues and ligaments damaged by long term irritation. 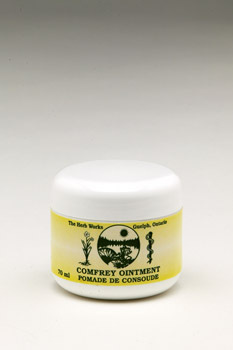 Ingredients:	Squaw Vine, Cramp Bark, Raspberry Leaves, White Pond Lily Root, Solomon’s Seal Root, Uva Ursi Leaves, Beth Root, Lady’s Mantle, False Unicorn Root. 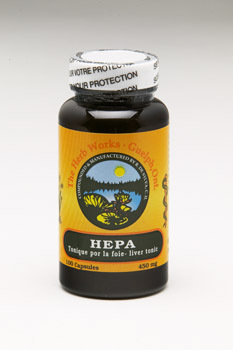 Suggested Dosage:	Take 3 capsules morning and again late afternoon or early evening. Contra-Indications:	Do not take with drugstore medicines for similar conditions or during pregnancy. 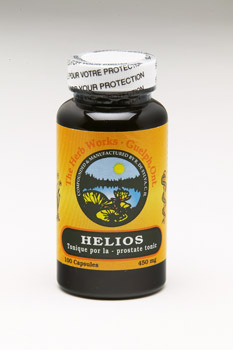 As the woman’s reproductive tract is sensitive, we have selected herbs with a gentle nature. They are cumulative in effect and for best results in chronic conditions, it is suggested that this formula be used for at least 6-8 months.